Great Racer and 2018 Spirit of the Event winner Scott Henderson passed away Thursday morning, October 18, after a courageous battle with cancer. Scott and his daughter Mallory have become fixtures on the event in their teal colored 1964 ½ Mustang convertible, first competing in the X-Cup Division and eventually the Sportsman Division. Scott famously used his car on Mount Washington to stop another competitors vehicle from rolling off the incline after it lost its brakes. He was awarded the Tom McRae Spirit of the Event Award at the finish in Halifax for his quick thinking and for his overall love for the Great Race and everyone involved in it. 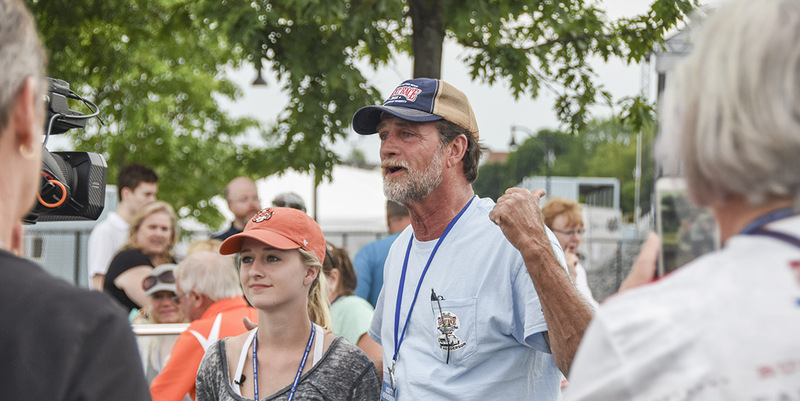 Everyone who knew Scott knew he loved life, he loved people, he loved his family  especially his daughter Mallory  and he loved the Great Race, friend and Great Race director Jeff Stumb said. Scotts son Travis and daughter-in-law Haleigh participated in their first Great Race this summer, and his father Jim has been a support crew member for years, truly making the Great Race a family event as so many do, Stumb said. Arrangements will be posted as soon as they are announced. Sadly, Jack Juratovic, the driver of the 1955 Buick station wagon which Scott saved from a horrible fate on Mount Washington, passed away suddenly Tuesday at his home in Michigan. So sorry to hear. Prayers to his family and all of those who were touched by him. I will certainly miss him. Condolences….that was something extraordinary up on the mountain that day….. Deepest condolences to both families. They will surely be missed. We wish both families God’s Peace. Condolences to the Henderson family, in this much needed time. Prayers for their heeling in this most difficult time of their life. Scott and Mallory became Tag and myself dear friends, thru the years, when we joined the Great Race Family as rookies together. Condolences to The Juratovic family with the passing of their love one as well. So sorry to hear of this sad news and the loss of a great man! Prayers and condolences to both families. The Great Race is genuinely a family affair and we care about each other. Scott demonstrated selfless courage that day on Mount Washington. So sad to learn this news. We’ve always enjoyed chatting with Scott and will miss him. We wish Mallory and her family peace and condolence. May he rejoice with the angels. Last year my wife and I traveled from Buffalo to Murphy, NC to be on the center line of the amazing August 2017 solar eclipse. It was there at the campground where we met Jeff Stumb and his family. On the day of the eclipse Jeff’s friend Scott Henderson was passing through and joined us for the event. A while back my wife had a 65 Mustang and when she found out about Scott’s 64.5 Mustang she was really excited. Scott promised her a ride when the Great Race would be in Buffalo in 2018 and at that moment it was obvious what a true gentleman Scott was. We enjoyed sharing our astronomy gear with everyone and the total eclipse was once in a lifetime experience. Jeff and I exchanged contact information, we parted ways and headed for home. In October of 2017 my wife went through several serious back surgeries and used Scott’s promise of the Mustang ride and attending the 2018 Great Race for something to focus on during her painful recovery. A week before the Great Race we received a phone call from Scott providing details of the festivities and to make sure we were on board. The day of the first gathering we met Scott and his daughter Mallory at the Pierce Arrow Museum. We were really touched when Scott said to us “welcome to the Great Race family”. Over the next few days events, Scott and Mallory always found the time to make sure we were enjoying ourselves even though all their fellow racers were in town. We were treated like family! Scott kept his word to my wife offering a ride in his 64.5 Mustang, however she was still in the healing process and she had to decline a ride. We did get plenty of pictures of her sitting in the Mustang with a grin from ear to ear. Seeing her smiling after all the surgeries was so rewarding! Although we didn’t know Scott for very long, his presence made a huge impact on our lives, especially with the surgeries my wife had gone through. Jeff, Scott, and myself talked about plans for the next solar eclipse, 2024 in buffalo. I guess Scott will have the best seat in house for this one. Our condolences go out to his family as he was a true gentleman and genuine person! Condolences to both families. We had the pleasure of meeting both men during the race and they both offered to help our Rookie Team in any way that they could. We will miss them at the 2019 GR.